Since the early 20th century, economics has been the dominant discourse in English-speaking countries, displacing Christian theology from its previous position of authority. This path-breaking book is a major contribution to the interdisciplinary dialogue between economics and religion. 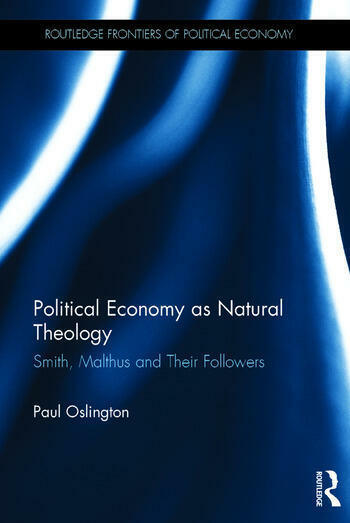 Oslington tells the story of natural theology shaping political economy in the late 18th and early 19th centuries, emphasising continuing significance of theological issues for the discipline of economics. Early political economists such as Adam Smith, Josiah Tucker, Edmund Burke, William Paley, TR Malthus, Richard Whately, JB Sumner, Thomas Chalmers and William Whewell, extended the British scientific natural theology tradition of Francis Bacon, Robert Boyle and Isaac Newton to the social world. This extension nourished and shaped political economy as a discipline, influencing its theoretical framework, but perhaps more importantly helping legitimate political economy in the British universities and public policy circles. Educating the public in the principles of political economy had a central place in this religiously driven program. Natural theology also created tensions (especially reconciling economic suffering with divine goodness and power) that eventually contributed to its demise and the separation of economics from theology in mid-19th-century Britain. This volume highlights aspects of the story that are neglected in standard histories of economics, histories of science and contemporary theology. Political Economy as Natural Theology is essential reading for all concerned with the origins of economics, the meaning and purpose of economic activity and the role of religion in contemporary policy debates. The future hope, nature and justice in Smith’s system. What can we learn from this episode about what promotes fruitful and unfruitful exchange between economists and theologians? Paul Oslington is Professor of Economics and Dean of Business at Alphacrucis College in Sydney, Australia. He previously held a joint appointment as Professor in the Schools of Business and Theology at Australian Catholic University, and before that Associate Professor of Economics at the University of New South Wales, along with visiting positions at the University of Oxford, University of British Columbia, Regent College Vancouver and Princeton Theological Seminary and University. He is also an honorary Research Professor at the Australian Centre for Christianity and Culture in Canberra.